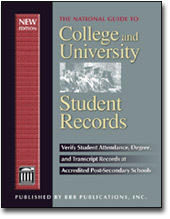 Transcript Records At Accredited Post-Secondary Schools! According To A recent survey, 28% o job applicants misrepresent their educational history and this is the most common misrepresentation job applications make. It's become the number one verification on pre-employment investigations. The new National Directory Of College And University Records enables the pre-employment investigator to have a head start in the verification process. An Index Listing Schools Alphabetically In State-By-State Format To Find Your Source Lightening fast! "Serving The Training Needs Of Invesigators For Over 25 years"